The continued craze of making any successful young adult novel into a movie strikes again with the adaptation of the 2013 novel, The 5th Wave. Of course the expectations are that if the first does well, then the other two novels in the trilogy would be adapted to complete the trifecta of a dystopian future. But much to the studios dismay, a franchise was not started this weekend. When a series of alien attacks decimate the planet, the human race balances of the edge of extinction. Seperated from her family, Cassie Sullivan (Chloë Grace Moretz) will do whatever is needed to make it back. Her journey leads her to a reluctant alliance with Evan Walker (Alex Roe), forcing them to trust one another as they fight for survival as the aliens prepare for the 5th attack. The concept from the start is interesting enough. An alien attack is always an interesting enough premise and placing perspective from that of a teenage girl rather than the typical action star is a welcome change. But then the story sinks into the classic young adult tropes and loses anything of interest, becoming more and more boring as the minutes tick by. It’s a shame that a good actress like Chloë Grace Moretz can’t get a great role. She seems prepared to take on her own franchise but the lack of anything of substance here will prove her efforts fruitless once again. Besides Moretz, the only standout is Maika Monroe, who I’m so happy is getting more roles (even if the movie is no good). Monroe’s character is the type who isn’t prepared to put up with anyone who can’t keep up. It’s a shame that the two strongest characters in the entire film weren’t fully unleashed. As discussed before, there are interesting ideas to begin the film, but director J. Blakeson takes everything silly and predictable and runs with it. There are very few entertaining moments as everything feels as it’s executed to check another item on the list. Blakeson goes through the motions, essentially making a simple premise much more difficult than it needed to be. The interest appears to be more on making money (which it likely won’t do) rather than actually being entertaining (which it certainly isn’t). 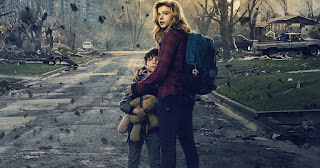 So what did you think of The 5th Wave? Have you seen it and what's the worst Young-Adult novel adaptation? Share, Comment, and always remember to return to I Am Sam for weekly reviews.